Издание: Economic geology, 1993 г., 10 стр. The Roberts Mountains of north-central Nevada are comprised of Paleozoic sedimentary rocks that host several gold deposits and subeconomic gold resources (Fig. 1). These gold occurrences are within a regional alignment of precious and base metal deposits in north-central Nevada termed the Battle Mountain-Eureka mineral belt (Roberts, 1966). Field relations and radiometric ages in three areas of the Roberts Mountains (Maher et al., 1990) allow assignment of minimum and probable maximum ages for gold mineralization. 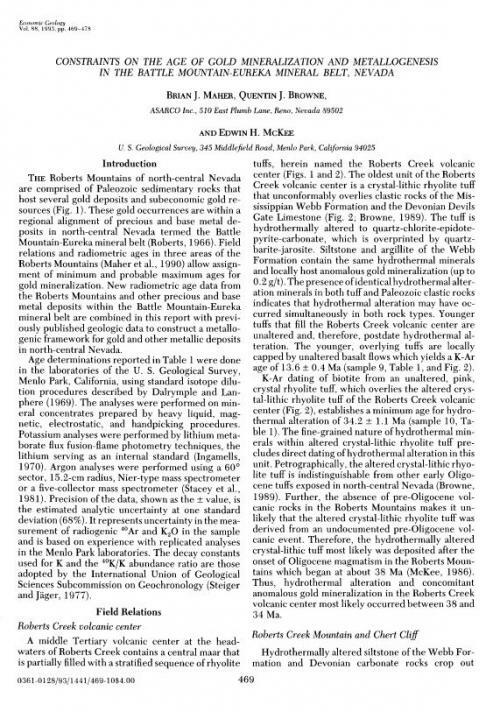 New radiometric age data from the Roberts Mountains and other precious and base metal deposits within the Battle Mountain-Eureka mineral belt are combined in this report with previously published geologic data to construct a metallo-genic framework for gold and other metallic deposits in north-central Nevada. 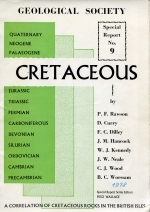 Издание: Geological society of America bulletin, 1991 г., 16 стр. Tectonostratigraphic terrane analysis of the western and central Baltic Shield defines a framework for continental growth through the period 2.50-1,75 Ga, Eight discrete terrenes can he defined in this part of the Svecokarelian orogen: the older cratonic Kuhmo and HsaJmi terranes, the hybrid Lapland and Savo province allochthonous ler-ranes, the juvenile island-arc-I ike Skeltefte-Savonlinna and south Finland-central Sweden terranes. (he back-arc or arc-tike Outokumpu nappe, and the ophiolitic (oceanic?) Jormua nappe. Stitching events can also he recngnized. These include the ca- 1.88-1.87 Ca Svionian magmalic arc, the ca. 2.44 Ca Koillismaa intrusions, the Kalevian flysch basin, and the Bolhnian basin. Constraining the age of these stitching events permits the construction of an accretion history in which the "Svecok3relian orogeny" can be resolved as a number of accretion events, deformation episodes related to accretion or mjgmato-tectonic episodes. These events, defined here, include the pre-2.44 Ca Pohjolan accretion of the component parts of the Lapland hybrid terrane. the ca. 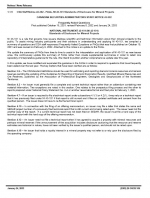 1.95 Ca Kyllikian accretion of the Karelian collage, Ihc ca. 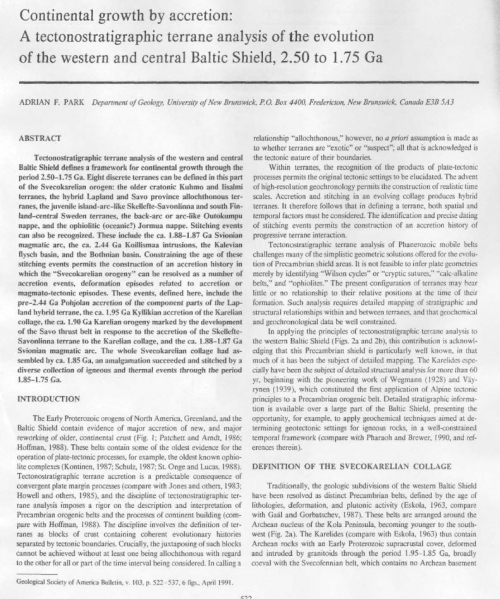 1.90 Ga Karelian orogeny marked by the development of the Savo thrust bell in response to the accretion of the Skellefte-Savonlinna terrane to the Karelian collage, and (he ca. 1.88-1.87 Ga Svionian magmalic arc. The whole Svecokaretian collage had assembled by ca. 1.85 Ca, an amalgamation succeeded and stitched by a diverse collection of igneous and thermal events through the period 1.85-1.75 Ca. Издание: Economic geology, 2004 г., 9 стр. 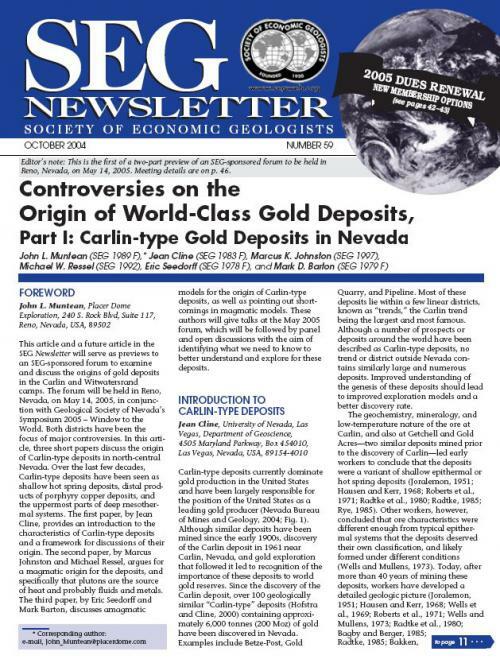 This article and a future article in the SEG Newsletter will serve as previews to an SEG-sponsored forum to examine and discuss the origins of gold deposits in the Carlin and Witwatersrand camps. The forum will be held in Reno, Nevada, on May 14, 2005, in conjunction with Geological Society of Nevada’s Symposium 2005 – Window to the World. Both districts have been the focus of major controversies. 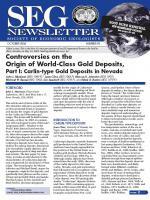 In this article, three short papers discuss the origin of Carlin-type deposits in north-central Nevada. Over the last few decades, Carlin-type deposits have been seen as shallow hot spring deposits, distal products of porphyry copper deposits, and the uppermost parts of deep mesother-mal systems. The first paper, by Jean Cline, provides an introduction to the characteristics of Carlin-type deposits and a framework for discussions of their origin. 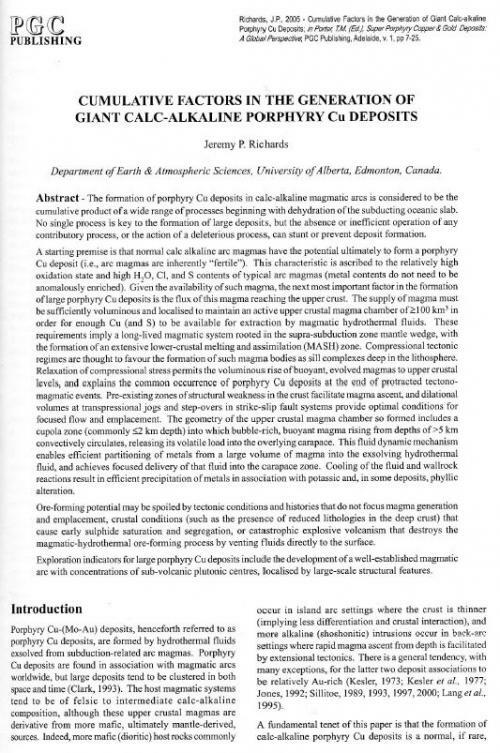 The second paper, by Marcus Johnston and Michael Ressel, argues for a magmatic origin for the deposits, and specifically that plutons are the source of heat and probably fluids and metals. 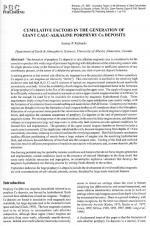 The third paper, by Eric Seedorff and Mark Barton, discusses amagmatic models for the origin of Carlin-type deposits, as well as pointing out shortcomings in magmatic models. These authors will give talks at the May 2005 forum, which will be followed by panel and open discussions with the aim of identifying what we need to know to better understand and explore for these deposits. Автор(ы): Geisen M., Mutterlose J., Wippich M.G.E. Издание: Ruhr-universitat Bochum, Bochum, 1997 г., 135 стр. 15 outcrops exposing sediments of Early and Late Cretaceous age (Berriasian-Campanian) are described from the Subhercynian Basin (Quedlinburg-Blankenburg area) and the eastern part of Lower Saxony (Salzgitter-Hannover area). 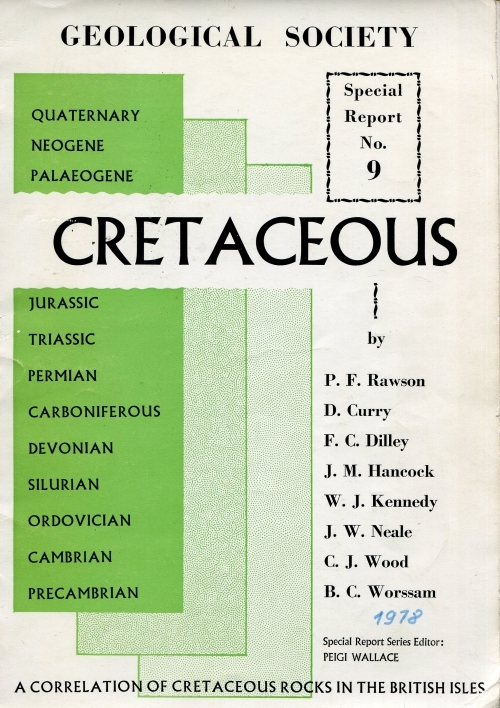 Apart from the bio- and lithostratigraphy, the fauna, flora, sedimentology, the palaeoenvironment and the regional position of these outcrops is discussed. New data and results going back to research performed from 1990 to 1996 are presented and sequence-stratigraphic models are proposed for some outcrops. Some of the microfauna and -flora and the macrofauna is documented by plates. The following outcrops exposing sediments of Early Cretaceous age are described: the Obernkirchen Sandstone (Berriasian) at Munchehagen (No. 15), mid-Hauterivian sediments rich in ammonites near Resse (No. 13), pale-dark bedding rhythms of Late Hauterivian age near Frielingen (No. 14), Hauterivian iron ores of the Glockenberg section (No. 5) and clays of Barremian and Aptian age near Sarstedt (No. 9). 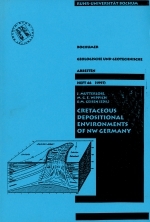 Outcrops of sediments of Late Cretaceous age are: Hoppenstedt (No. 3), Vienenburg (No. 4), Baddeckenstedt (No. 6), and the HPCF II quarry at Misburg (No. 10), exposing the Cenomanian and Lower Turonian; the sediments exposed in the Salzgitter-Salder quarry (No. 7) are of mid-Turonian to Early Coniacian age, the Lehofsberg section near Quedlinburg (No. 1) is of mid-Coniacian age; shallow marine elastics of early Campanian age of the Subhercynian Basin are described from near Blankenburg (No. 2), marly and calcareous Campanian basinal sediments are exposed in the HPCF II (No. 10), Germania IV (No. 11) and Teutonia I (No. 12) quarries at Misburg. Издание: E.Schweizerbrat'sche Verlagsbuchhandlung, Stuttgart, 1989 г., 978 стр. 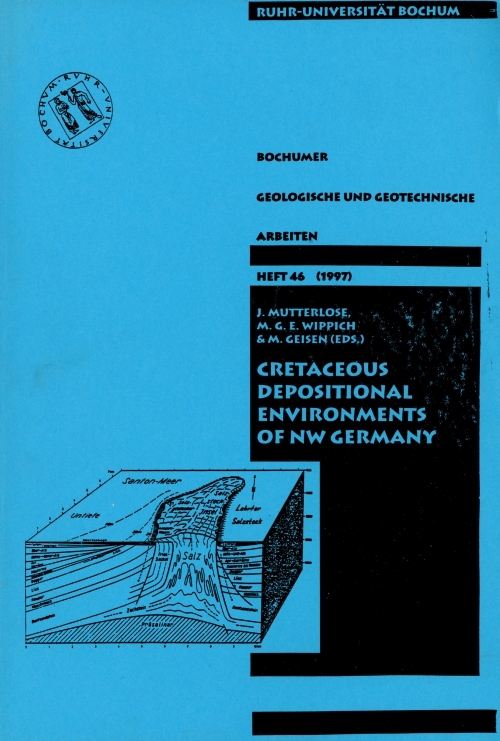 In 1978, in Munster, the German Subcommission on Cretaceous Stratigraphy initiated a first International Symposium on the Cretaceous. The focus of the symposium was on Germany and Central Europe. The proceedings were published in 1979. 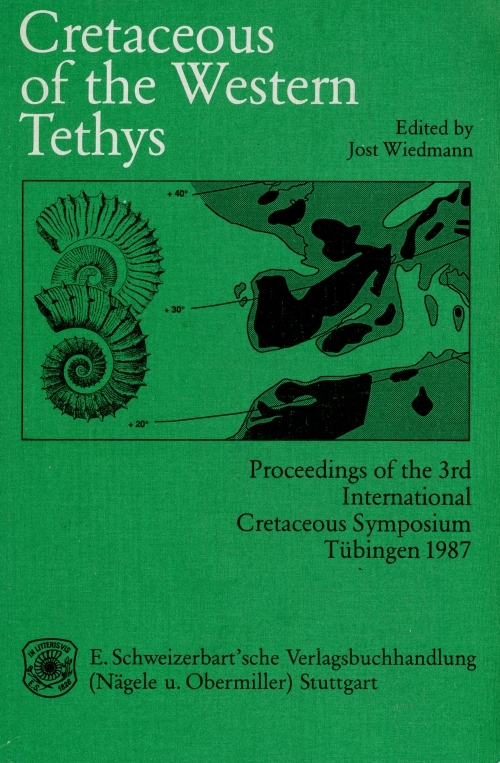 The second symposium was held in 1982 in Munich and concentrated on the Alpine Cretaceous. The proceedings were published in 1983. 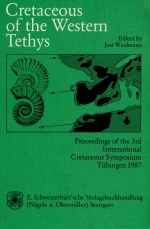 Published in this volume are proceedings of the third symposium, which took place in Tubingen in 1987 and whose topic was the western Tethys. The participants of the symposium unanimously decided to dedicate the volume published to TOVE BIRKELUND in response to the loss of our highly esteemed Danish colleague. Автор(ы): Curry D., Dilley F.C., Hancock J.M., Kennedy W.J., Neale J.W., Rawson P.F., Wood C.J., Worsasam B.C. Издание: Scottish Academic Press, Edinburg, 1978 г., 70 стр. Автор(ы): Godard G., Kunze K., Mauler A.
Издание: Journal Tectonophysics, 2001 г., 32 стр. 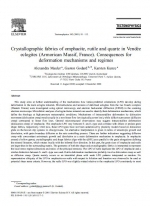 This study aims at further understanding of the mechanisms how lattice-preferred orientations (LPO) develop during deformation in the main eclogite minerals. Microstructures and textures of deformed eclogites from the Les Essarts complex (Western France) were investigated using optical microscopy and electron backscatter diffraction (EBSD) in the scanning electron microscope. Microfabric analyses of eclogite-facies minerals are used to identify their deformation mechanisms, which define the rheology at high-pressure metamorphic conditions. Mechanisms of intracrystalline deformation by dislocation movement (dislocation creep) result usually in a non-linear flow law (typically power law), while diffusive processes (diffusion creep) correspond to linear flow laws. General microstructural observations may suggest intracrystalline deformation (dislocation creep) of omphacite. The omphacite LPO vary between S- and L-type and correlate with oblate or prolate grain shape fabrics, respectively. Until now, these LPO types have not been understood by plasticity models based on dislocation glide on the known slip systems in clinopyroxene. An alternative interpretation is given in terms of anisotropic growth and dissolution, with grain boundary diffusion as the rate controlling process. There are further indications suggesting diffusion creep with concomitant anisotropic growth and dissolution as a main deformation mechanism in omphacite. In omphacite around a hollow garnet, crystallographic and shape fabrics align with the c axes parallel to the grain elongations defining the mineral lineation, which rotates locally with the inferred flow direction. In this part, the grain sizes of omphacite and rutile are larger than in the surrounding matrix. The geometry of both the shape and crystallographic fabrics is interpreted to represent the local stress regime (directions and ratios of the principal stresses). 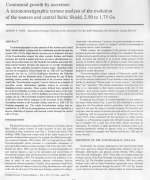 The LPO of rutile duplicate the LPO of omphacite and a similar distinction between S- and L-type was used. Rutile deformation mechanisms probably involve dislocation creep as well as diffusion creep. Quartz mainly occurs as an interstitial phase with weak LPO patterns interpreted as random. 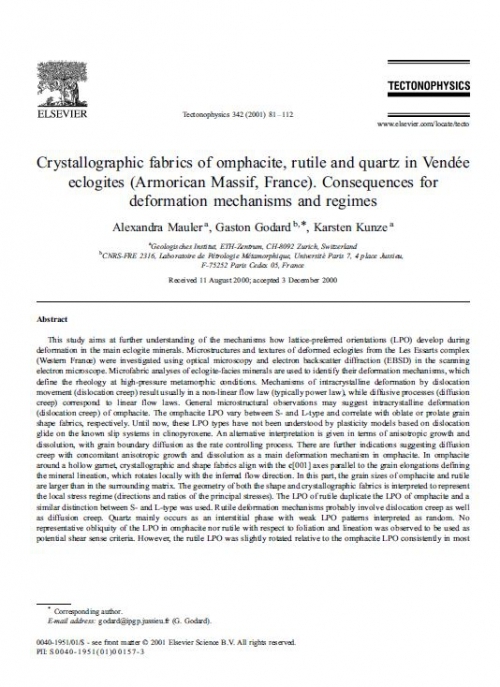 No representative obliquity of the LPO in omphacite nor rutile with respect to foliation and lineation was observed to be used as potential shear sense criteria. However, the rutile LPO was slightly rotated relative to the omphacite LPO consistently in most samples. The results suggest that diffusion processes are strongly involved in the deformation of eclogites. A linear flow law should be taken into account in tectonic models where eclogites are incorporated. Автор(ы): Chopra P.N., Drury M.R., Fliervoet T.F. 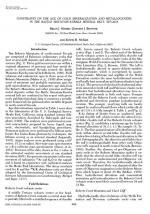 Издание: Journal Tectonophysics, 1999 г., 27 стр. 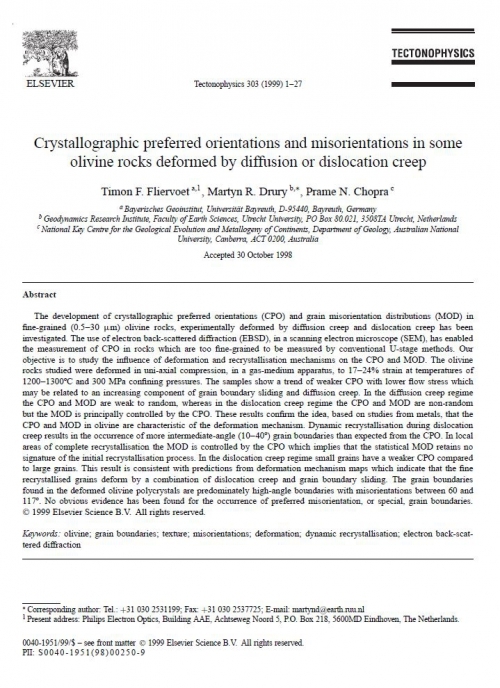 The development of crystallographic preferred orientations (CPO) and grain misorientation distributions (MOD) in fine-grained (0.5–30 µm) olivine rocks, experimentally deformed by diffusion creep and dislocation creep has been investigated. The use of electron back-scattered diffraction (EBSD), in a scanning electron microscope (SEM), has enabled the measurement of CPO in rocks which are too fine-grained to be measured by conventional U-stage methods. Our objective is to study the influence of deformation and recrystallisation mechanisms on the CPO and MOD. The olivine rocks studied were deformed in uni-axial compression, in a gas-medium apparatus, to 17–24% strain at temperatures of 1200–1300ºC and 300 MPa confining pressures. The samples show a trend of weaker CPO with lower flow stress which may be related to an increasing component of grain boundary sliding and diffusion creep. In the diffusion creep regime the CPO and MOD are weak to random, whereas in the dislocation creep regime the CPO and MOD are non-random but the MOD is principally controlled by the CPO. 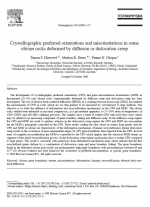 These results confirm the idea, based on studies from metals, that the CPO and MOD in olivine are characteristic of the deformation mechanism. Dynamic recrystallisation during dislocation creep results in the occurrence of more intermediate-angle (10–40º) grain boundaries than expected from the CPO. In local areas of complete recrystallisation the MOD is controlled by the CPO which implies that the statistical MOD retains no signature of the initial recrystallisation process. In the dislocation creep regime small grains have a weaker CPO compared to large grains. This result is consistent with predictions from deformation mechanism maps which indicate that the fine recrystallised grains deform by a combination of dislocation creep and grain boundary sliding. The grain boundaries found in the deformed olivine polycrystals are predominately high-angle boundaries with misorientations between 60 and 117º. No obvious evidence has been found for the occurrence of preferred misorientation, or special, grain boundaries. Издание: Canadian Securities Administrators, 2003 г., 17 стр. NI 43-101 is a rule that governs how issuers disclose scientific and technical information about their mineral projects to the public. 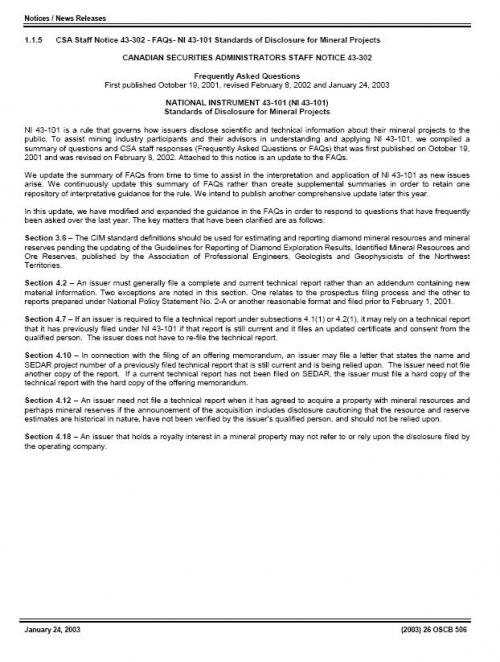 To assist mining industry participants and their advisors in understanding and applying NI 43-101, we compiled a summary of questions and CSA staff responses (Frequently Asked Questions or FAQs) that was first published on October 19, 2001 and was revised on February 8, 2002. Attached to this notice is an update to the FAQs. We update the summary of FAQs from time to time to assist in the interpretation and application of NI 43-101 as new issues arise. We continuously update this summary of FAQs rather than create supplemental summaries in order to retain one repository of interpretative guidance for the rule. We intend to publish another comprehensive update later this year. Издание: PGS Publishing, Linden Park, 2005 г., 19 стр. The formation of porphyry Cu deposits in calc-alkaline magmatic arcs is considered to be the cumulative product of a wide range of processes beginning with dehydration of the subducting oceanic slab. No single process is key to the formation of large deposits, but the absence or inefficient operation of any contributory process, or the action of a deleterious process, can stunt or prevent deposit formation.